One of the biggest advantages Android phones, tablets and the ecosystem as a whole have over other mobile operating systems like iOS is their support for 3rd party themes which are referred as launchers. There are hundreds of different launcher apps available for Android phones and tablets which you can download from Google Play Store. Some of those apps are available for free while some have price tags. Unfortunately, the majority of launchers use excessive amount of memory that put some significant negative effect on the overall performance of the device. However, some launcher apps which have been designed and developed by good developing teams have overcome this issue by optimizing the performance and visual of the graphics for low end devices too. For example, CM Launcher is a well known launcher app which works equally good on high end devices as well as on low end devices. It is mainly popular because of its small size, customizability, high performance and security. CM Launcher is not only fast but it also doesn’t work in the background all the time. It means it uses the battery smarty and doesn’t drain it too often. This might seem a small advantage but this power optimization can give the Android devices some extra hours of battery which is specifically good because Android phones are notorious for their low battery life. The developing team behind CM Launcher releases beta versions every now and then. You might experience some performance and lagging issues with those but the final versions are stable. Another thing that matters a lot in case of Android launchers is their user interface. One of the reasons why users prefer 3rd party launchers over the native Android user interface or the interface installed by the manufacturers is the easiness of user interface. CM Launcher is highly customizable and you can change almost everything according to your preferences and taste. 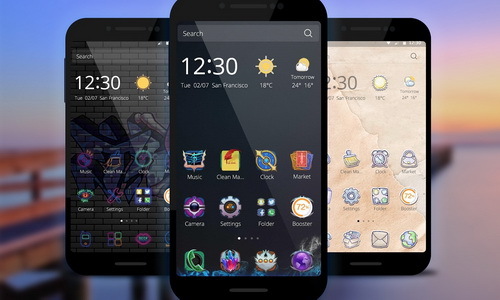 There are lots of different themes available which can make your device even more beautiful. The latest version of CM Launcher comes with built in security feature that automatically scans every app you download and install. Although this integrated security feature is limited and comes with limited functionality but it does the job perfectly and adds an extra layer of security. If you want more security features on your Android device, you can download CM Security from Google Play Store. CM Security is developed by the same team and it is considered one of the best security apps available for Android devices at this moment.